Buttermere adjoins Lorton Civil Parish along its northern boundary and Loweswater Civil Parish on its west side. According to the 2001 census, there were 49 households across the parish with a total population of 127. For an accurate map of the Buttermere Parish boundary, see here. 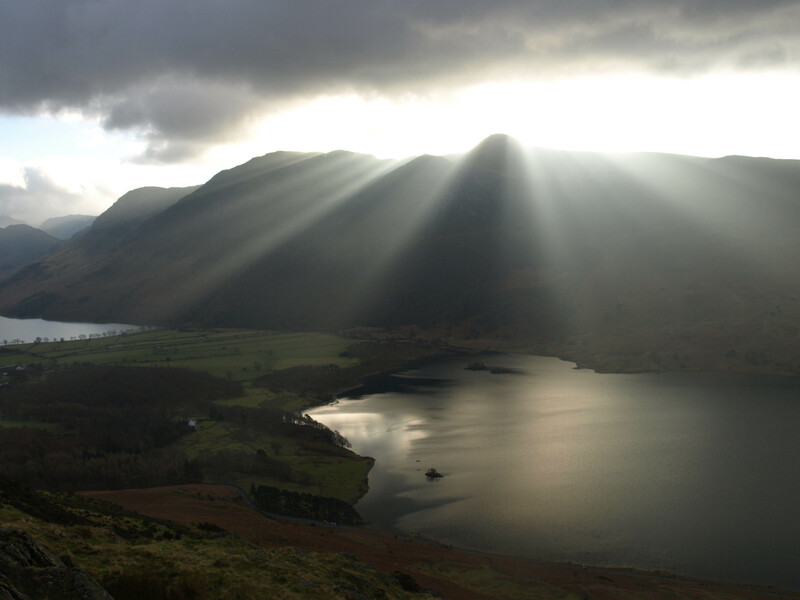 The Parish includes two lakes that stretch down its length, Buttermere and Crummock Water, which are each surrounded by fells and mountains save in the north. about 90 feet deep. 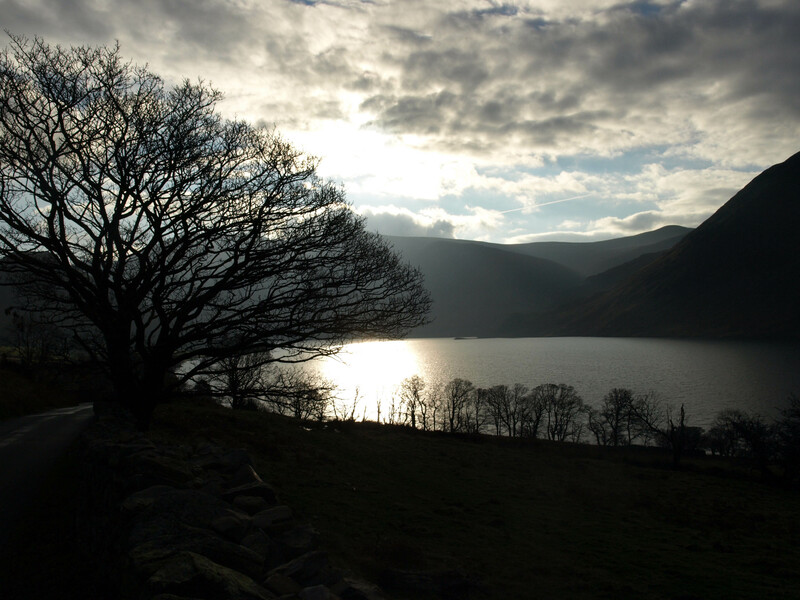 Both lakes, Crummock Water and Buttermere, are owned by the National Trust. Water sports are banned, although small rowing boats are allowed. There are two possible origins for the name Buttermere, according to the entry on the Wikipedia website. First, that it is derived from the Old English “butere mere” – “the lake by the dairy pastures”; second that it is a corrupt form of a personal name “Buthar”, as in “Buthar’s mere” (lake). 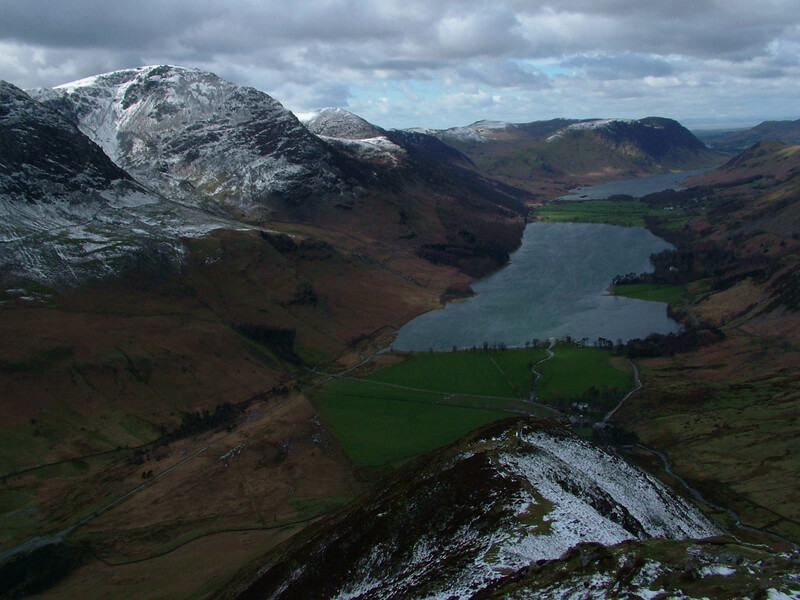 Local tradition has it that the valley of Buttermere was part of the holdings of an 11th century Norse chieftan called “Buthar”, sometimes spelt “Boethar”. Rannerdale Knotts is one of the smaller fells in the Buttermere Valley. At the end of the 11th century, the people of Buttermere ambushed the invading Normans here, leaving their bodies to rot. During the Spring and early Summer, part of the lower slopes of the fell is a glorious blue thick with a carpet of bluebells. It is said they cover the area where the Normans were left to rot. The story is evocatively told by Nicholas Size in his novella “The Secret Valley”. 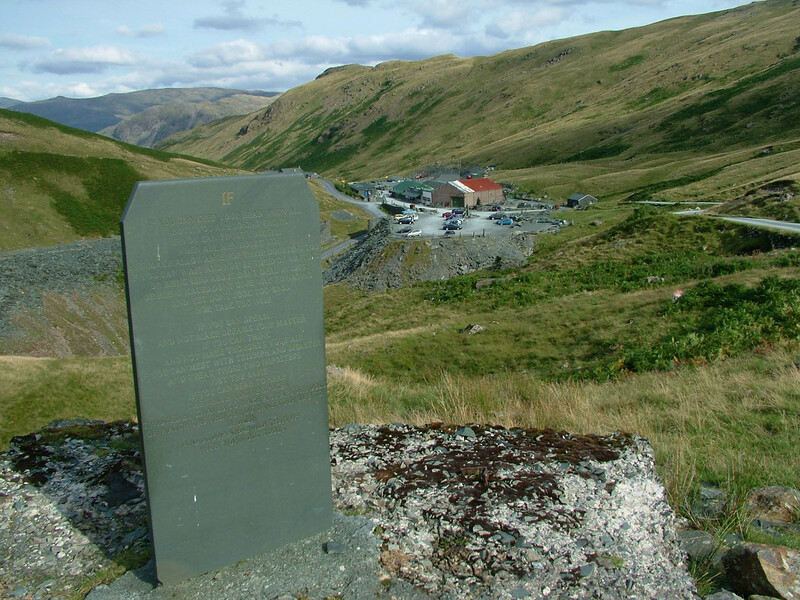 The famous Honister Blue slate mines on Honister Cragg, which forms the south side of the narrow Gatesgarthdale, are to the south east of Buttermere Lake. Many labourers from Buttermere were employed in the mines. It is recorded that these mines or quarries were well established by the early 1700s, and it is thought that they could date back to as early as Roman times. Transporting the slate in the early days was by packhorse across the mountains from Honister to Wasdale Head, and then on to Ravensglass to boats which would ship the slate around the British Isles. In 1986 the mines closed after a lengthy period of decline. In 1996, Bill Taylor and Mark Weir secured the lease and took over the mines. Their father and grandfather respectively had worked in the mines previously. They restored the buildings and equipment and after a lot of hard work production began again in 1997. It is producing a significant amount of slate using traditional skills. The mines now attract many visitors and have recently won a Tourism Attraction of the Year Award. During the Second World War, many of the hotels in Buttermere were full. Many well off people wanted to escape the bombing in the cities and so took up residence in the village. Although it continued after 1945, Buttermere School was very small with only a few children attending and closed in 1950. The building, owned by the Church of England, was left unused for several years, but, in the 1990s, the Revd. Michael Braithwaite, at the time Vicar of the United Benefice of Lorton, Loweswater and Buttermere, encouraged the people of Buttermere to raise money to renovate the building so it could be used as a village hall. This was achieved and the hall is now used for a variety of events. In late October, the Shepherds Meet, which used to be held in the village of Buttermere but is now held at Lanthwaite Green, takes place. It was and remains a way for sorting out the sheep from the higher fells and getting them back to their rightful owners. This is the last agricultural show of the season in the district. Mary Robinson (1778-1837), known as ‘The Maid of Buttermere’, was the daughter of the landlord of the Char Inn (now the Fish Hotel). She became famous after a visiting writer noticed her beauty and began to write about her in his ‘Fortnightly Rambles in the Lakes’. These writings began to attract visitors to the Inn, including some of the great poets of the day. Wordsworth mentions her in The Prelude. Mary married John Hatfield bigamously at the age of 15 in 1802. He called himself ‘Colonel Hope’. The marriage of the beauty to the brother of an Earl, as he claimed to be, was widely reported. Hatfield was later exposed as an imposter, bigamist and forger. He was arrested, escaped, but was subsequently captured in Wales. He was tried at Carlisle and hanged in 1803. The story captured the public’s imagination, and money was raised on Mary’s behalf. Mary later married a local farmer, Richard Harrison, in 1807 and had four children. The story has been popularised more recently in Melvyn Bragg’s novel ‘The Maid of Buttermere’. [Source of information: an entry on Wikipedia]. John Nicholas Size (1866-1953) was born in Liverpool and followed his father into railway administration. He developed a fondness for the Lakes, and in 1920 reopened the derelict Bridge Hotel which he renamed The Victoria Hotel. Size continued with his railway career while investing in the hotel. In 1927, he left the railway industry and moved into the hotel. He was particularly interested in the heritage of the area and joined the Cumberland and Westmorland Antiquarian and Archaeological Society. Size was best known for his novels and writings about the Norse Settlers in the Lake District. He wrote a booklet “The Epic of Buttermere” portraying the valley as a stronghold of resistance to the invaders, and the site of a supposed ‘Battle of Rannerdale Knotts’. It was such a success that in 1929 he wrote an expanded illustrated novella version called The Secret Valley, which was equally successful. He was encouraged by Sir Hugh Walpole to continue his writing and he later wrote a learned paper on the remains of a Norse Mill at Buttermere. This all helped to promote his hotel business. In the 1930s he bought two pieces of land. One was a relatively flat area leading down to Crummock, where he developed a nine-hole golf course which was free to guests. The hotel then became known as the ‘Victoria Golf Hotel’. The second piece of land was a pretty piece of woodland along a beck which he named the ‘Fairy Glen’. He also acquired the Buttermere Hotel which is now the Youth Hostel. Size had applied and got permission to be buried in a plot of his own choosing on the fell-side above the ‘Fairy Glen’, as there is no burial ground at Buttermere. The Vicar, Geoffrey White, saw no reason to deny this and agreed. Size died in the middle of dreadful weather, with incessant torrential rain. Conditions for grave digging were not good. The topsoil on the chosen site was shallower that expected which meant having to blast a hole deep in the rock. All the church windows had to be covered and protected. The rain continued, water pouring into it like a stream in flood, it being impossible to divert as there was rock all around the area. Once the coffin was in the grave, large rocks had to be put on top before the grave was filled in. [Source of information: an entry on Wikipedia and local oral history]. Several notable people have lived in what became known as the Climbing House at Lower Gatesgarth. William Irving (1898-1966) was Huntsman of the Melbreak foxhounds from 1926 until 1951. He was born and bred into a traditional Cumbrian way of life in Ennerdale. His father, also named Willie Irving, farmed at Ennerdale and married Sarah Tyson. She was from a family who were a famous and prominent hunting clan in the western fells. Sarah’s father Willie Tyson, also of Ennerdale, bred hard coated terriers that could stand up to the harsh conditions of the Lake District. Willie Irving went to school at Ennerdale Bridge and spent his free time, when he wasn’t working on family farms or hound trailing, playing football in the winter and guide racing in the summer. Guide races later became known as fell races or fell running. It was reported that Irving was very difficult to beat. He was extremely fit and strong and won several of these races. Willie Irving took up farming when he left school. By this time, the family had moved to another farm in Bootle, near Millom. In 1916, Irving acquired his first terrier which was from the Eskdale and Ennerdale hunt. Willie Porter, of Field Head Farm at Eskdale was one of the top breeders of working terriers. In his early years, Irving worked for the Eskdale and Ennerdale Foxhounds’ huntsman, and became an official whipper-in later in the 1920s. By this time, he was also a champion fell runner. It was while working at Eskdale that he met and married Maud Black of Boot, a village that lies in the upper reaches of the Eskdale Valley. Irving was appointed Huntsman of the Melbreak Foxhounds in 1926. A cottage at High Thrushbank, near Loweswater came with this job. In the same year, their first daughter, Maud was born. They had a second daughter, Pearl, a few years later. The Hunt kennels in those days were at Banks’ farm at High Park at the foot of Melbreak (see banner photo and here), which gives the Pack their name. New kennels were required, and Millar Place below Dodd Fell in the Parish of Buttermere was bought. It took some time for the renovation and new kennels to be built. The Irving family moved into Millar Place during the summer of 1928. From 1916, Irving began to make his contribution to the breeding of Lake District terriers. In 1930, Irving’s famous ‘new’ breed of Lakeland terrier ‘Turk of Melbreak’ was born. He was registered with the Kennel Club in 1931. Like Willie Porter before him, Irving became well known for producing harsh coated stock to cope with the very hard conditions in cold weather on the fells. He was also known for producing a good head and bone structure in his terriers and they were much prized, as were his hounds. Today, many lines of terriers descend from Turk of Melbreak. 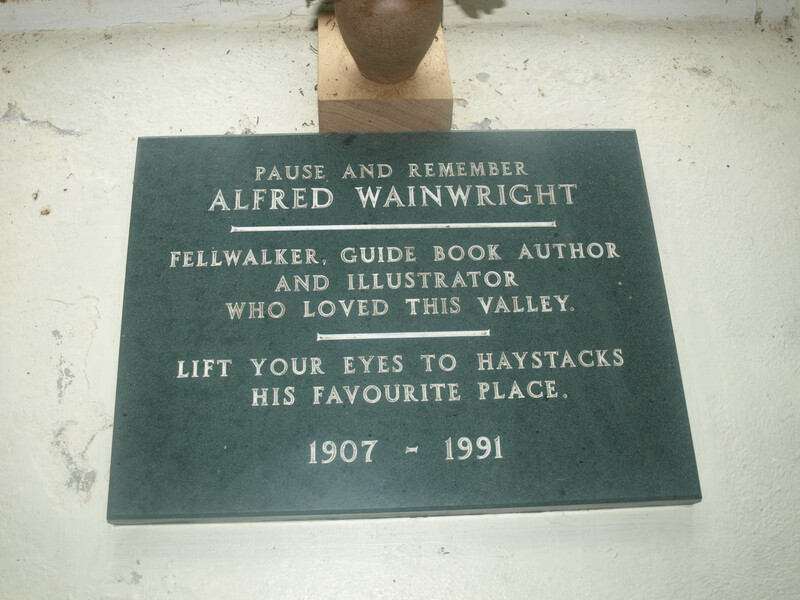 Alfred Wainwright MBE (1907-1991) will always be remembered for his famous Pictorial Guides to the Lakeland Fells. There is a Memorial in St James’ Church, Buttermere and his ashes were scattered above the village on his favourite fell, Haystacks. [Source of information: an entry on Wikipedia].